Quiller Press, 2009, Hardback in Dust Wrapper. Condition: Very Good — in Very Good Dust Wrapper. A little rubbing to the edges of the dust wrapper. A nice copy. From the cover: “Test match special is both a sporting and broadcasting institution that has become synonymous with British summertime. Since its first live broadcast back in 1957 it has proudly lived up to its original slogan ‘Don’t miss a ball, we broadcast them all’. During much of this time the man behind the scenes was Peter Baxter and here for the first time, he recalls the best moments and characters from his privileged perspective inside the TMS commentary box. 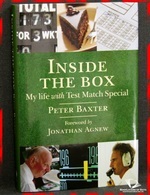 Throughout this period Peter Baxter worked alongside the legendary John Arlott, the inimitable Brian Johnston and the unforgettable Henry Blofeld and ushered in new faces, such as Jonathan Agnew, who continue to entertain, inform and charm listeners today. This book is both a celebration of three decades of cricket and a unique insight into the world of radio and broadcasting. Foreword or introduction by Jonathan Agnew. Size: 9½" x 6¼". Green boards with Gilt titling to the Spine. 224 pages.